After saving the world twice, the fight continues for Flynn "Fly" Taggart and Arlene Sanders! Hugh and Linaweaver do a lot of things right with the series. As an obvious fan of the franchise since childhood, I will do my best to highlight the best aspects of the novel. 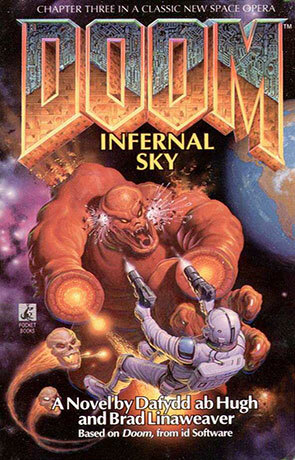 Despite my opinions, this review is redundant if you have not yet enjoyed the first two novels of the Doom series, which are far superior to the last two books: Knee-Deep in the Dead and Hell on Earth. While the mission in Hell on Earth is still underway, Fly and Arlene find themselves soaking up some rays in Hawaii, awaiting the next phase of the mission. Circumstances send them, along with Arlene’s Mormon sweetheart Albert, back to Mars and into an active portal. To avoid too many spoilers, I will stray from what happens next and begin highlighting the novel’s strengths. First, the love story between Arlene and Albert, coupled with Fly’s mixed emotions for Arlene drives the story line and, also, Earth’s fate. Also, time plays an important part, a force acting against the characters’ mission to save those they love who remain on Earth, as well as Pluto (Remember! In 1996, Pluto is a planet). Time is always against us, especially when considering close to light speed travel. Additionally, two new characters are introduced to the novel. From the military base in Hawaii, Esteban Hidalgo accompanies them throughout the mission, officially leading the mission. Despite his type-A personality and brass and balls approach to the mission, Fly works hard to discover the man’s true virtue and heart while on a suicidal mission to save their planet. Yet, they learn that not only their planet is at risk. Worlds have been destroyed and Sears and Roebuck, two binary aliens, know all about it! Perhaps the most depressing element of the plotline is that our beloved Fly and Arlene discover that Earth might not be the most important planet… And that a galactic struggle—unlike Earth’s religious wars—might be the very undoing of not just the blue planet but all galactic life. Written on 25th November 2014 by D. L. Denham.